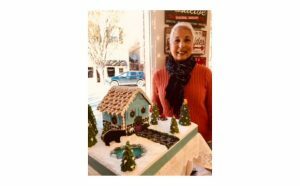 The New Bern Historical Society presented the first batch of Gingerbread House Contest Awards at the Beary Merry festivities on Friday. An excited crowd anticipated the results as Executive Director Mickey Miller announced the winners and invited the crowd to see all of the gingerbread houses which will be on display at downtown merchants until December 18th. In the Youth Division, a team of three grandchildren took first place. Chris, Bella and Selena Herrera, won with their Chrissellena Lane which can be seen at the post office. The trio, organized by grandmother Laura Dunbar, was excited to collect their cash prize of $100. 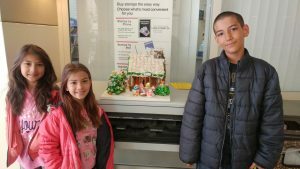 Runner-up in the division, winning a $50 gift card to Academy Sports, was Declan C. whose Candy Cane Mansion is on display at The Four C’s. New this year was the Nancy Chiles Heritage Award going to the entry that best reflects the theme Historic New Bern Christmas. There were a number of outstanding entries considered for this award. It was a very close decision with the top 3 only 1 point apart. 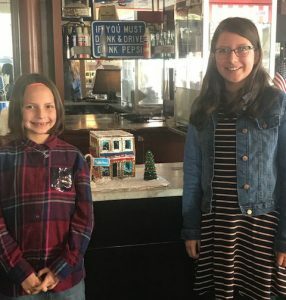 The first annual Nancy Chiles Heritage Award was presented to Liberty and Lilly Canady, the LC Duo, whose A Pepsi Christmas was a reproduction of Caleb Bradham’s pharmacy, now the Birthplace of Pepsi. The People’s Choice Award is still being decided by popular vote. The public may vote in front of the Birthplace of Pepsi on Dec. 4, in front of the O. Marks building on December 8. The first vote for everyone is free. Additional votes are $1 each. People may also vote on the New Bern Historical Society Facebook page by liking their favorite. The Nancy Chiles Heritage Auction is also still underway. The marvelous reproduction of Tryon Palace created by Mary Hamilton Chiles in honor of her mother, is on display at Bella’s Café & Catering at 323 Middle Street. A silent auction, with bidding inside the café will go until December 15th. The winner will take home Mary Hamilton’s amazing Tryon Palace. The mission of the New Bern Historical Society is to celebrate and promote New Bern and its heritage through events and education. Offices are located in the historic Attmore Oliver House at 511 Broad Street in New Bern. For more information, call 252-638-8558 or go NewBernHistorical.org or Facebook.com/NewBernHistoricalSociety.